It’s simple, you need potassium for plants if you want healthy plants. It’s vital that you have the right amount of potassium in your soil because large amounts are absorbed from the plant root zone during crop production. Garden potassium is usually applied as potash, which helps plants in making good use of the available water. A healthy balance of potassium enhances the quality and size of produce. What Happens When Plants Don’t Get Enough Potassium? Without enough potassium, plants experience a nutrient deficiency and show it with stunted growth. Furthermore they produce fewer flowers, vegetables and fruits, resulting in reduced crop yield. A plant not receiving enough potassium may have scorched looking leaves that curl up at the tips. The leaves may also appear crinkly, dry and white spotted around the edges. Overall plant growth slows without potassium, and plants suffering with potassium deficiency symptoms will quickly succumb to high temperatures and high winds. How Can You Give Your Plants A Dose Of Potassium? While commonly found in soil, most soil does not have enough soil potassium to keep plants strong and healthy. Conduct soil tests to identify the current nutrient content, potassium levels or trace elements before applying anything. This will help you come up with the most perfect soil solution. Additionally, sometimes the soil may hold a high potassium level but not in a form that plants can easily use and absorb. Supplement the needed plant nutrients with a good quality fertilizer. You’ll find a limited number of usable fertilizer materials to supply K when needed. Potassium-Magnesium Sulfate – used when the need for magnesium exist. Many gardeners get the magnesium from epsom salt and swear it’s their secret weapon. To give your plants a boost of potassium, you can use either a liquid foliar fertilizer spray or a solid fertilizer for a quick fix. Follow directions to apply your potassium fertilizer correctly to provide a potassium boost. Remember that chemical and synthetic fertilizers do not typically provide ongoing potassium supplements for your plants, but if your plants are potassium deficient these products will provide a bit of a jumpstart. 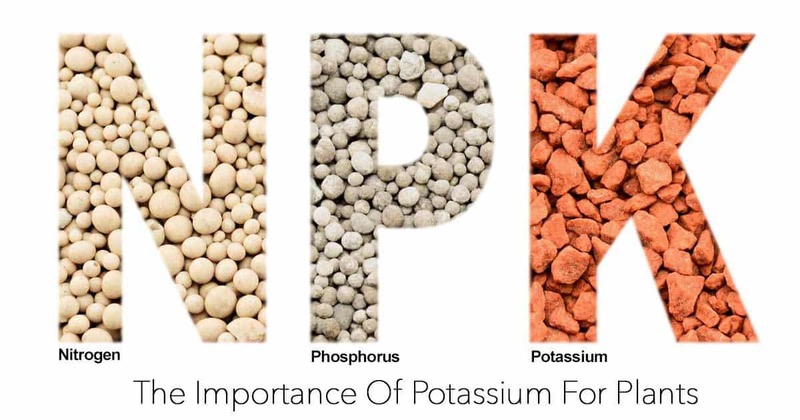 You should also check the n-p-k ratio (nitrogen, phosphorus and potassium) of the fertilizers before buying them. For ongoing nutritional support, you must take care to amend your soil regularly with organic compost for steady, slow release nourishment. Take care to check soil pH and get a soil test before you add any nutrient solutions or amendments. Remember that amending without understanding what you’re correcting is very likely to make matters worse [nutrient burn] instead of better. The Role Of Potassium – What Does It Do? When you give your plants a dose of commercial fertilizer, the potassium it contains should help plants to perk up fairly quickly. The reason for this is that the plant nutrients found in chemical fertilizers are water-soluble. This means they dissolve rapidly in water and plant uptake is absorbed almost immediately. Potassium works by controlling plant stomata. These are the cells that control water within the plant structure. If your plant has not had enough potassium, the stomata will not use water efficiently. This means that your plant will become vulnerable to heat stress with plant tissues having less disease resistance. Smart Fertilizer shares – Potassium triggers activation of enzymes and is essential for ATP production – Adenosine Triphosphate. ATP is an important energy source for many chemical processes taking place in plant issues. When you provide your plants with a potassium concentration, it stimulates the stomata to work efficiently. Additionally, the potassium provides nourishment for necessary enzymes. All of these factors work together to help the plant make the most of the nutrients in the soil to keep leaves and plant roots healthy and produce more flowers, fruits or veggies. Just remember that water-soluble nutrients are only helpful in the short-term. Long-term correction of potassium deficiency must be addressed with ongoing use of organic soil amendments. No Matter What You Are Planting, It Needs Potassium! From lawns to roses, tomato plants and food crops, all plants need a generous amount of easily absorbable potassium to grow big and strong and produce abundantly. With a healthy amount of potassium, plant growth is properly regulated and plants can thrive and produce in abundance.